Morinosuke Kawaguchi’s “Moe Economy” is a buzzword—in Chinese! Morinosuke Kawaguchi’s seminal book: “Otaku de onnano ko na kuni no monozukuri” (English title: Geeky-Girly Innovation: A Japanese Subculturist’s Guide to Technology & Design) was the first book he has written and it was published by Kodansha BIZ in 2007. It was awarded the prestigious Nikkei BP BizTech Book Award 2008 in Japan, given to books that contribute to the advancement and development of technology and management. It was translated into Korean and Chinese in 2009. 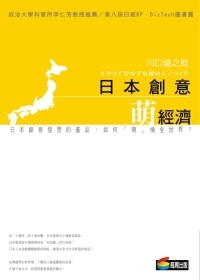 In Taiwan, it was listed among the top ten “Great Technology Management Books 2010”. That same year Taiwan’s Small and Medium Enterprise Administration, Ministry of Economic Affairs and South Korea’s KITECH, the Korea Institute if Industrial Technology, studied the book to be applied in their countries’ technology and innovation strategies. The Thai translation was published in 2011 and the English version in 2012. So why is Morinosuke’s book again picked up by the Chinese language media now, in August of 2016? Because Tokyo’s newly elected governor, Ms. Yuriko Koike, has been explaining to voters that it is her strategy to revive Tokyo’s economy with the help of Japan’s abundant subculture. She said she would turn Tokyo and even Japan into “anime land”. Ms. Koike also participated in cosplay events dressed as Sally the Witch , and called herself Yuri chan–instead of Sally chan. We like that and we like her for that! No wonder that journalists writing about her in the Chinese readers, has been referring to Morinosuke Kawaguchi’s book as its title in Chinese could be translated into English as “Moe Economy”. Great news for Japan and us, and we are very happy that she brought back the idea of Moe Economy but we are actually not certain whether Ms. Koike or her staff even read Morinosuke’s book…of course, we are very happy if they did, and even if they have not, we are delighted that journalists have! Thank you! We also recommend that she uses “Moe Economy” as a buzzword and we’d love to support her to develop it!